CI-Mail-Policy is an email flow control software for centrally applying rules and actions, like adding professional email signatures, to all emails processed by a Microsoft Exchange server. Actions can be applied to emails sent from any device or client - including mobiles. 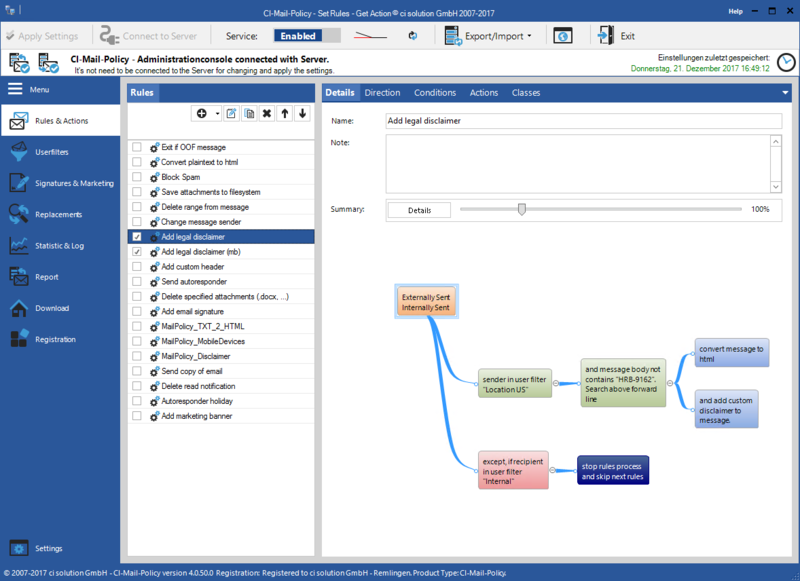 CI-Mail-Policy is an email flow manager designed especially for Microsoft Exchange server. It’s powerful and flexible rule-based framework lets you manage, monitor an enforce a variety of email policies. They can be applied to all incoming and outgoing emails in your organization without having to visit a single PC. The basic concept of CI-Mail-Policy's rules and actions is similar to Microsoft Exchange's "Mail Flow Rules" (also know as Transport Rules) – just without the hassle of configuration and a lot more versatile. Like the transport service CI-Mail-Policy runs as a service on the Exchange Server. When emails pass the Exchange, CI-Mail-Policy checks and enforces the policies you've created on them. As it all takes place while emails are in transit - being sent from a to b - neither sender nor recipient can prevent actions from being applied. What can CI-Mail-Policy do for you? Monitor emails for specific words / content and act upon them: redirect/forward, block, reject or delete the messages or send a message / a copy of the original message to specified recipients. Central management – easily manage and deploy standardized email signatures for your entire company from one single spot. Internal vs external – differ between internal and external emails i.e. use short signatures for internal messages and append signatures with a lengthy disclaimer only to externally sent messages. Long vs short – Use longer signatures on the first message and use signatures that contain only essential details on all subsequent replies. Extended conditions – base rules on data only the Exchange can capture: internal vs. external, send date, message recipient etc. 100% HTML – Convert all plain-text emails into full HTML allowing you to add imagery like logos, web banners and photos; no matter what device the email is being sent from. This guarantees that every email sent will have the same high-quality Exchange email signature appended. 100% secure – no chance for users to modify their individual signatures as they are being added on server level via Exchange. Sent items update – All signatures, disclaimer and banners are visible in the Sent Items folder, also on mobile devices. Delegate & save time - Simple rights management to control permission to template editor. Let the marketing department create and edit email signatures and promotional campaigns without them having to access the Exchange server. Use it to delegate work and save time. Auto-pilot mode – Changes in design, rebrands, new contact details will be rolled out centrally without any user interaction required. Your user’s email signatures will always be up-to-date. Email forwarding and routing – rule based forwarding and rerouting of incoming, outgoing or internal emails. 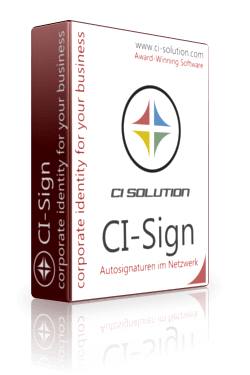 Email address rewriting – rewrite specific email addresses to general ones, like m.morgan@ci-solution.com to support@ci-solution.com. Custom rule deployment – Give users different signatures based on Active Directory groups, organizational units (OUs), the user’s department or location or many other filters. Email signature marketing – customize email signatures by adding campaigns to promote awards, products, upcoming events, … Schedule and manage campaigns in advance and let CI-Mail-Policy take care of the rest. Power-user mode – switch between design and syntax highlighting HTML source code mode for detailed control of your templates. Graphics support – Include logos, user photos, social media icons and any other graphics to your email signatures. Unify your brand’s image – Enforce your corporate design on all emails. Easily set email fonts, formatting, themes and stationaries. You can even set font type and size for emails written in OWA and Office 365. Legal compliance guaranteed - Enforce your corporate design on all emails. Easily set email fonts, formatting, themes and stationaries. You can even set font type and size for emails written in OWA and Office 365. Personalization – add personalized signatures including user’s Active Directory data and photos. Flexible positioning – Choose where to insert the signature, disclaimer or banner: under the latest mail, at the very top or bottom of the email or at a specific position by replacing a text, e.g. “sent from my iPhone”. Email attachment control – Add, compress, strip (save to file system) or dump email attachments. Multi-tenant & multi-server support – automatic replication of settings between multiple servers. CI-Mail-Policy is licensed on a per user basis. The table below shows the price per user/license. When purchasing new licenses a one year Service Maintenance Plan (SMP) is included. After expiration you are free to extend the SMP to 15 % of the license price per year; see column "SMP extension".